Developing these skills and emphasizing them in a job interview can help you rise above the job market competition. Clear communication is essential in customer service. You need to know what the customer wants and be able to articulate what you can do for the customer. Enunciating, speaking loudly enough, and employing an upbeat tone will help you communicate clearly and positively with your customers. These skills are essential in phone communication as well. If you write or email with customers, be sure to use proper grammar and spelling and choose words and phrases that convey a similarly upbeat attitude. Listening skills are just as important as communication skills. Listen carefully to customers to know exactly what they need and how you can help them. Demonstrate that you are actively listening through body language and responses. Nod when you understand something, make eye contact, etc. Don’t be afraid to ask clarifying questions to make sure you understand the other person. An important aspect of customer service is simply making the customer feel heard. When you're talking on the phone, don't interrupt customers, and carefully respond to all of their questions. 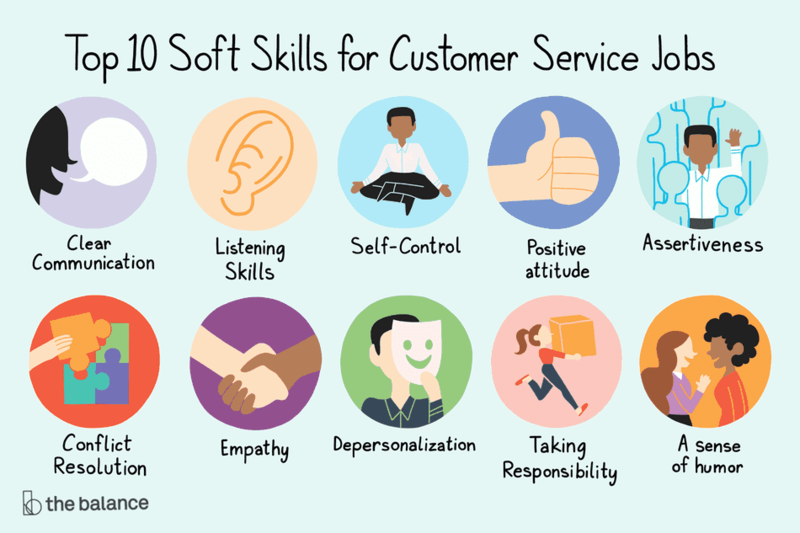 Self-control: People who work in customer service need to be able to calmly handle all customers, even the most negative ones. You must strive to remain calm and cool, even when your customer is not. Patience and self-control will keep you from getting upset and saying something inappropriate. Remember to try not to take it personally when the customer is upset. When the customer is angry, it's even more important to stay calm and try to tone down the conversation. A positive attitude goes a long way in customer service. Make sure you know all of the benefits of the products or services your company provides and convey them to your customers. If customers have a problem with a product or service, focus on what you can do to help them. While you don’t want to seem overly happy when a customer is upset, being proactive and optimistic can help a customer stay positive too. Assertiveness: When dealing with customers, you want to be able to take control of the situation and do what you need to do in an efficient manner. If you are meek or passive, customers may not have faith in you. However, you also don’t want to be aggressive or demanding, which can offend customers. By speaking in a strong, steady voice, asking direct questions, and keeping track of what you need to do, you will convey confidence without being aggressive. Conflict resolution: In customer service, you deal with many customers who have a problem that needs to be solved. It is important for you to be a creative problem solver. Always make sure you understand problems clearly and offer customers possible solutions. Think creatively; often you will need to think of solutions that fit the needs of a specific customer. If you cannot find a solution that works for a customer, help her locate additional help. If you need to, escalate the issue to someone else who can solve the problem. Follow up with the customer to make sure the issue has been resolved. Customers will appreciate your interest in their problem and your willingness to help in whatever way possible. Empathy: It is important to understand what customers say and also how they feel. An important soft skill is being able to recognize and understand a person’s emotional state. If you struggle to convey empathy, think about being in that customer’s position. How would you feel? How would you like to be treated? What would you feel like if you had the same problem the customer did? These questions will help you to identify with and better assist your customers. Depersonalization: While you should be friendly with your customers, remember that you are not there to share your life story. When a customer explains an issue he is having, there is no need for you to respond with your own, related problem. A simple “I understand” or “I know how you feel” can make the customer feel understood and appreciated. Customers want you to focus on helping them. Taking responsibility is a big part of working in customer service and that includes being able to say, “I’m sorry,” whether it’s for a late shipment or the poor quality of a product. You have to be able to sincerely apologize to a customer on behalf of your company even when the problem was not your fault. Hearing an apology almost always makes a customer feel better. A sense of humor can make a potentially stressful customer-service interaction more enjoyable. If a customer cracks a silly joke, she will appreciate it if you chuckle along with her. However, make sure you are never laughing at a customer, such as when they make a mistake or have trouble with something. Instead, laugh with your customers. Do You Have the Top Skills Employers Want?